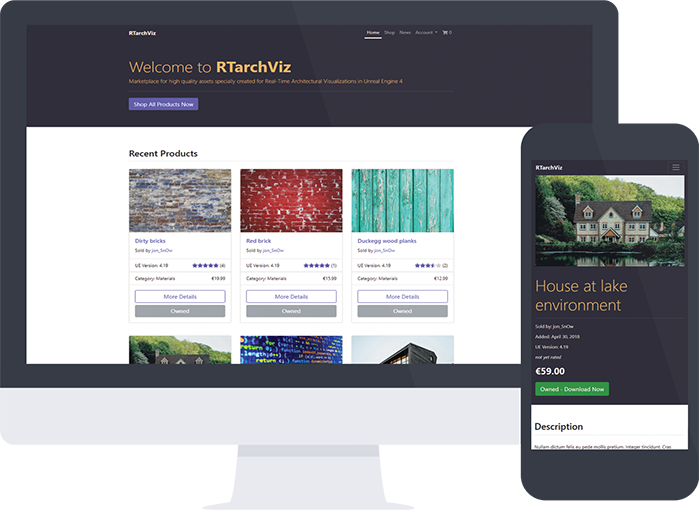 RTarchViz is a (fictional) marketplace for high quality assets specially created for use in real-time architectural visualizations in Unreal Engine. These assets can consist of, but are not limited to, in-engine 3d models, sounds, blueprints, scripts, and full environments. Registered users have the ability to not only buy products, but also list their own digital products. Each user has access to their own private dashboard containing a list of their products for easy management (edit or remove product), sales analytics, total profit, and download links to any product they may have purchased from other users. The project is built using Django, Python based full-stack web framework with conjunction with other back-end modules and front-end libraries. The web application communicates with a PostgeSQL database for storing and retrieving user account and profile information, products, orders, blog posts, and sessions. As RTarvhViz is a large project, more detailed info about all of its features can be found in the github repository linked below.